With the success of Die Beautiful during the 2016 Metro Manila Film Festival, I suppose it should come as no surprise that this year's "more commercial" MMFF still featured an LGBT comedy as part of the entries. The fact that both movies have death as a central theme does make for an odd coincidence though. I went into Dedma Walking without any real knowledge of the movie apart from (at the time) hearing that Edgar Allan Guzman had won the Best Supporting Actor Award for his performance. I had seen one of the early trailers and it didn't quite grip me nor did it seem to capture what the actual movie was about. As with many local LGBT ventures, there's a heavy reliance on stereotypes in order to get the message across. I suppose this is somewhat of a necessary evil as it presents gay men in ways that most movie-goers can better understand. But at the same time you can't help but wonder if this will also hold the community back at the same time as not everyone fits the gay mold presented in most local movies. 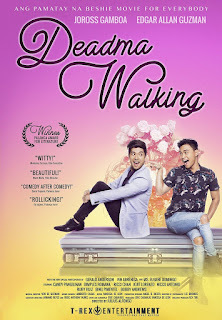 Synopsis: Dedma Walking is a Philippine LGBT comedy drama movie directed by Julius Alfonso. The screenplay was written by Eric Cabahug and also won second prize at the 2016 Calos Palanca Awards. John (Joross Gamboa) is a closeted gay man who learns that he has cancer and it has reached a point where he only has 1-2 years left to live. As this weighs heavily on his mind, he decides to enlist the help of his more flamboyant theater friend Mark (Edgar Allan Guzman) to fake his death and host his funeral so that he may experience it before dying. It's an unusual request but one that eventually Mark relents to despite the risks. As John's condition continues to decline, the plan is executed and the extravagant 3-day wake begins with different friends and family arriving and each day ending with people sharing eulogies for John. John attends the funeral in secret in order to hear what everyone has to say. What I Liked: I can understand why Guzman won Best Supporting Actor for his movie as he often feels like the centerpiece of the film. He's a louder than life character but one that remains committed to being a friend as Guzman was committed to portraying his role. He goes through a lot of complex emotions over the course of the movie and does so quite well. As campy as his character is written to be, he doesn't come across as overly shallow either. I will give credit to either the screenplay or the final direction for the movie given the ambition in its production and structure. The movie features a crazy number of cameos, cutaways to scenes from a stage musical and even excerpts of a faux French art film to boot. They make for great breaks amid some of the heavier drama and I totally get a kick out of Eugene Domingo over-acting how to be in an art film. What Could Have Been Better: It's not immediately clear what level of humor the movie demands of the audience as it jumps up and down the spectrum of slapstick to witty. The cuts across different scenes whether they're stage moments, art film excerpts, flashbacks or fantasy scenes, you're never quite sure if everything as meant to be funny. There are some honestly great comedic moments but the whole thing doesn't quite come together in a coherent whole with a clear tone. The movie also seems to go on for just a little too long including a "twist" ending that somehow felt unnecessary. There's also some major stereotyping that drives the movie such as how both John and Mark are quick to become distracted to the point of stopping mid-conversation whenever someone seemingly attractive is near or how despite John being closeted is still pretty campily effeminate. As much as they wanted to present John and Mark as sort of yin and yang characters, that didn't seem apparent. Nor was it evident that John was even closeted as it was not a key point in the narrative - just something you read in the official write-ups of the movie. This is not to say that movie depiction of gay men should not be effeminate, but more that local LGBT movies seem forever limited to presenting gay men as "parloristas" mainly and not much else. And this is yet another movie that adds to that notion down to the expected universal love for beauty queens and knowing who they are when they appear as cameos in the movie. TL;DR: Dedma Walking is a decent movie but it doesn't quite break new ground in any significant way. Laugh at the cameos and especially Eugene Domingo and enjoy Guzman's pretty good performance to distract you from the more confusing bits inherent to the film. Thus the movie gets 3.5 scenarios for how John's death is supposed to happen out of a possible 5.